Two years ago, Jeanne Mackin had finished her first novel for NAL and was casting about for a new subject. In The Beautiful American, Jeanne had written about Vogue model/photographer Lee Miller, a lover of surreal artist Man Ray in 1930s Paris and the first woman to photograph the Nazi concentration camps after their liberation, and she was looking for another historical figure with artistic associations. One name came to my mind. I had recently visited the Bronx Botanical Gardens and spent time in the Peggy Rockefeller Rose Garden, designed by Beatrix Farrand. I’d learned that although the garden wasn’t created until the 1980s, Beatrix Farrand designed it in 1916. And somewhere I’d read that Beatrix was also a niece of Edith Wharton. Gardens and books—the combination certainly appealed to me, and I was delighted to learn that it appealed to Jeanne as well. “You know I wrote the Cornell book on herbs and flowers,” she told me. I hadn’t known, but we both felt she’d found her subject. Finding the story wasn’t nearly as easy. Jeanne called me, lamenting, “Beatrix led such a normal, responsible life. Where’s the conflict? How do I make her interesting?” I encouraged her as best I could, but Jeanne found a solution that went far beyond anything I could have imagined. Instead of writing a straightforward fictional biography, she borrowed a narrative style from Henry James, who was also a close friend of Beatrix, and created a narrator named Daisy (ring any bells?) who tells a small but crucial portion of Beatrix’s life story through the lens of her own experience. For good measure, Jeanne includes a ghost, inspired by James’s The Turn of the Screw. In fact, there is more than one ghost. And Jeanne writes a love story for the young Beatrix, despite Beatrix having been known in her early years for ignoring the strong expectation that she marry and instead pursuing a career—something that women, especially women of her class, never did. A Lady of Good Family is a beguiling narrative with echoes of novels by Wharton and James that explores relationships between mothers and daughters, husbands and wives, and art and artists during a time of great change for women. Like Willa Cather’s The Song of the Lark, it is also the story of a woman finding the courage to defy convention and follow her true passion; and of the forces that shape her as both a creative artist and as a woman. 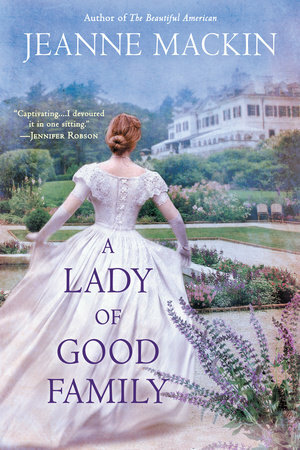 Set in Europe and New York during the Gilded Age and the early 20th century, A Lady of Good Family brings Beatrix Farrand to full and vibrant life, and proves that in the hands of a talented writer, even someone with a “normal, responsible life” can become utterly compelling. And now I have had the pleasure of visiting some of the gardens that Beatrix designed. I especially recommend Dumbarton Oaks, just outside Washington, DC. And, of course, the Peggy Rockefeller Rose Garden in our own backyard. Read more about A Lady of Good Family here.